Two of the country's most famous express "rides" are connected to the quaint but glitzy St. Moritz. Both the Glacier Express and the Palm Express are included in the Swiss Rail Pass system (click on the box below for more information). They are comfortable means of transportation over several hundred miles, but they are more than that. They are an "attraction" worth visiting. They offer a unique experience that allows exceptional viewing of exceptional scenery. The time spent aboard the train and bus should not count as a negative to anyone. The great vistas make the trip seem too short. Between Zermatt and St. Moritz along the southern part of Switzerland is perhaps the pride of the Swiss rail service, the famous Glacier Express. It is known as the slowest speed train in the world, and it doesn't disappoint. Throughout the entire 7 ½ hour trip, the scenery is spectacular at every turn. The railway snakes through seven valleys, 91 tunnels and over 291 bridges. At Oberalp Pass, the Glacier Express climbs to 6,670 feet. You can't help yourself as you just look out each side of the train, entranced by the beautiful green valleys, alpine pastures and picturesque villages. 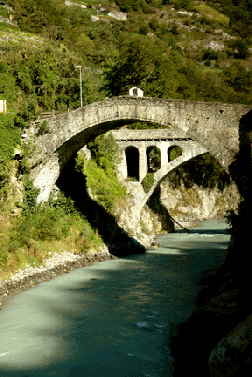 You can see many of the beautiful bridges constructed of stone ahead of the train as the engine turns towards them. Snow-covered peaks and glaciers reach for the skies above the serene valleys. Switzerland has the largest proportion of glacial areas in the Alpine region, covering almost 3% of the country. As if knowing that photography is required, the train slowly winds through passages and through tunnels, continually surprising the passengers with yet even more beautiful views of valleys, farms, vineyards and snow-capped mountains along the way. Described as having glass roofs, the railcars we were on had larger-than -normal picture windows but not an actual glass roof. With camera in hand, we clicked away at many beautiful vistas that sometimes sped past our window a little too fast. The dining car for individuals is charming, with a wood interior and ornate upholstery. The dining car for groups instead is quite formal, and the food is excellent. We traveled on the Glacier Express from Zermatt to Graubunden, Switzerland's largest canton (similar to a county in the U.S.) and St. Moritz. Like all other trains in the rail system, you CAN set your watch by the train schedule. Much to our surprise, the toilets on the train were open holes onto the train tracks. Only a few times did a rail car have a flushable chemical toilet. We found this interesting but an extreme disappointing contrast to the obvious love for nature that the Swiss have. For more information, visit www .glacierexpress.ch on the web. St. Moritz is very close to many cities that easily showcase the area's Italian influence. We decided to visit one of the country's southernmost cities - Lugano, and check out the Palm Express Postbus route. We left St. Moritz on a panorama bus, and once again, the Swiss Pass which included the Palm Express, came in very handy. As scenic as the train routes are, the scenic 4-hour Palm Express Bus tour offers an even more up-close view of the towns and architecture of the area as it descends almost 5,000 feet over the course of the trip. Crossing the Maloja Pass, the bus began its hair-pin turns down the mountain from the Engadin area into the Bergell Valley. We drove through the small towns and villages with obvious Italian names like Vicosoprano and Stampa. 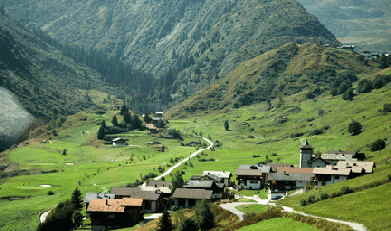 Switzerland - Order FREE Travel Brochure! Roman history was easy to see in the castle ruins and garrison walls of Pomontogno, through the Swiss/Italy border city of Spino and as far as Piuro. Centuries -old stone houses still stand in excellent condition. On more than one occasion, the street in each village became only one-way, with the bus always having the "right of way" versus any cars coming from the opposite direction. The streets were so narrow that literally inches separated each side of our large vehicle from the buildings. Scrapings from not-so -careful previous bus drivers were evident on the ancient walls. From Chiavenna to Sorico, our route traversed an entire valley where granite quarries were the main industry. Giant mountains had been sheared by granite factories. Truly this part of Northern Italy is where the historically famous Italian marble comes from, and the industry is indeed what keeps this area busy. 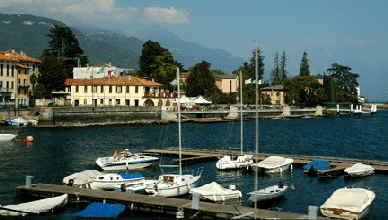 Our route bordered scenic Lakes Mezzola and Como and veered west at Menaggio. Here, the architecture of the homes was much more Mediterranean in style, with red tile roofs, balconies with wrought iron. At Porlezza, some beautiful lakefront villas on Lake Lugano added to the obvious Italian flavor of the area and it was obvious this was a popular resort area for retreat for those who could afford such luxury. 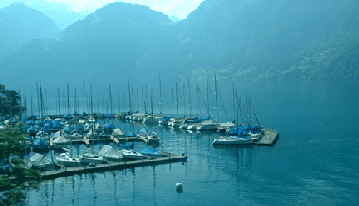 The entire trip to Lugano offered many great opportunities for photography.